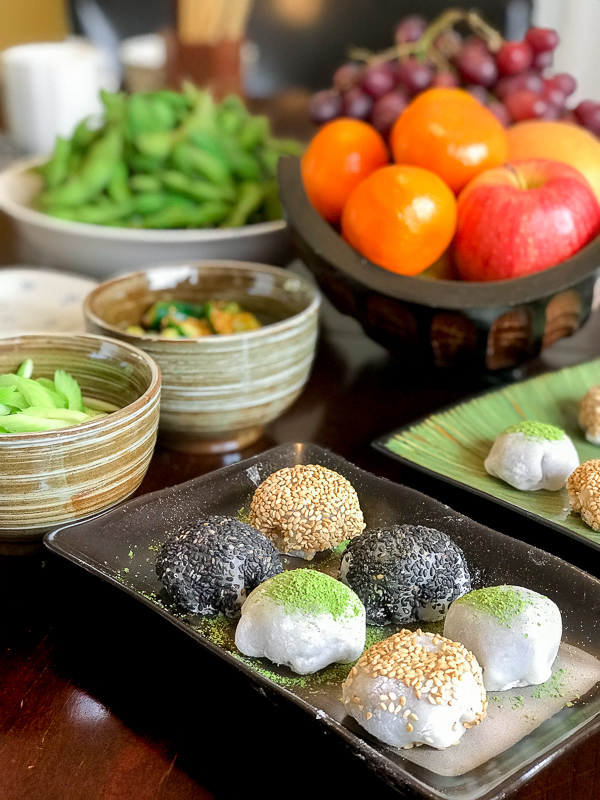 Mung Bean Daifuku Mochi is a delicious bite of spring with tender chewy Japanese mochi (pounded sticky rice flour) stuffed with sweet mung bean paste. One bite of Mung Bean Daifuku Mochi and you will be hooked. These are the perfect little treats to enjoy with tea and friends. Today we served them with a little matcha (green tea) latte. 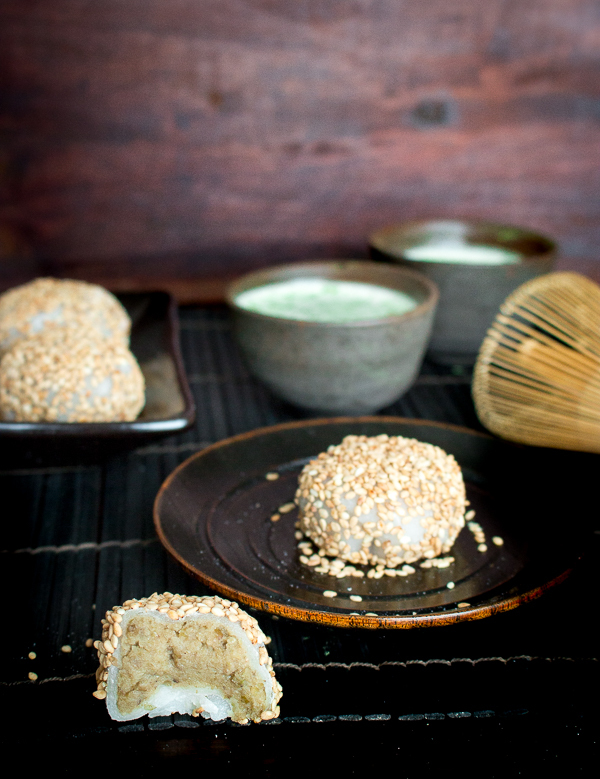 You are just going to love that tender and delicately sweet thin mochi layer and then the creamy sweet mung bean inside. The white mochi layer is made with sweet glutinous rice flour. 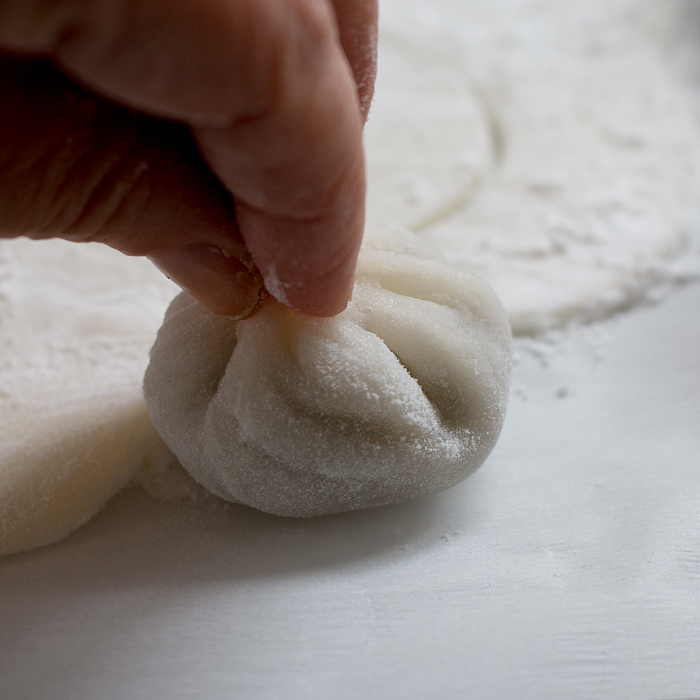 We used Koda Farms Mochiko Sweet Rice Flour to make our Mung Bean Daifuku Mochi. You can find sweet glutinous rice flour in many stores including Target, Walmart’s, Amazon and in an Asian grocery market. You can use any sweet glutinous rice flour brand you desire. Please note that there is very distinct difference between plain rice flour and sweet glutinous rice flour. They are not the same. You must look for sweet glutinous rice flour or otherwise your recipe will not turn out correctly. Even though the word “Glutinous” rice flour sounds like it has gluten in it, it is gluten free. The word glutinous refers to how the rice becomes sticky when wet ingredients are added to it. 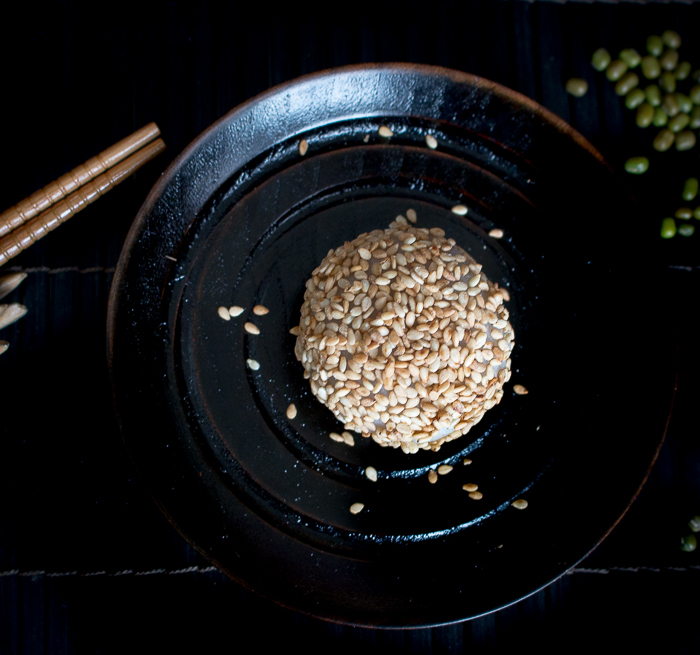 Mung Bean Daifuku Mochi is also dairy-free and vegan. Spring is on the horizon and our thoughts are in warmer weather and new growth. Matcha is harvested in the spring and just in time to enjoy the sakura (cherry blossom) blooms and hanami (viewing of the sakura- cherry blossoms). 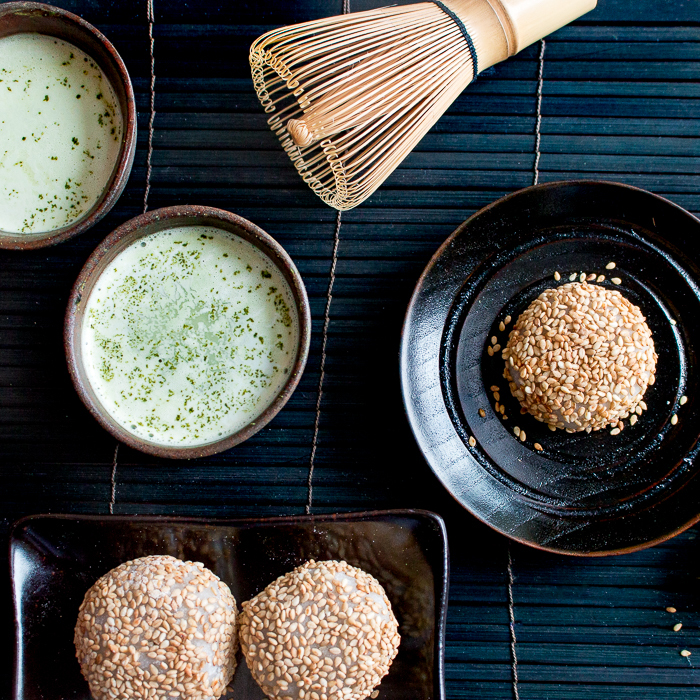 It is always nice to share a little treat with your tea and Mung Bean Daifuku Mochi is the perfect pairing. If you are looking for other delicious treats to enjoy during Sakura (Cherry blossom) season be sure to try our Matcha Red Bean Energy Balls, Baked Matcha Lemon Glazed Donuts , or our Magic Matcha Bars . Daifuku Mochi is traditionally stuffed with adzuki (sweet red bean paste). However, they can also be made with icecream in the center, strawberries and cream, sweet potato and many other delicious stuffings. We topped our Mung Bean Daifuku Mochi with both toasted black and white sesame seeds and topped some with a little dusting of matcha (green tea) powder. You can also serve them plain without any toppings and this is up to you. Dried Mung Beans are made into a sweet mung bean paste mixture for this recipe. Mung beans are a member of the legume family and can be eaten either savory or sweet. 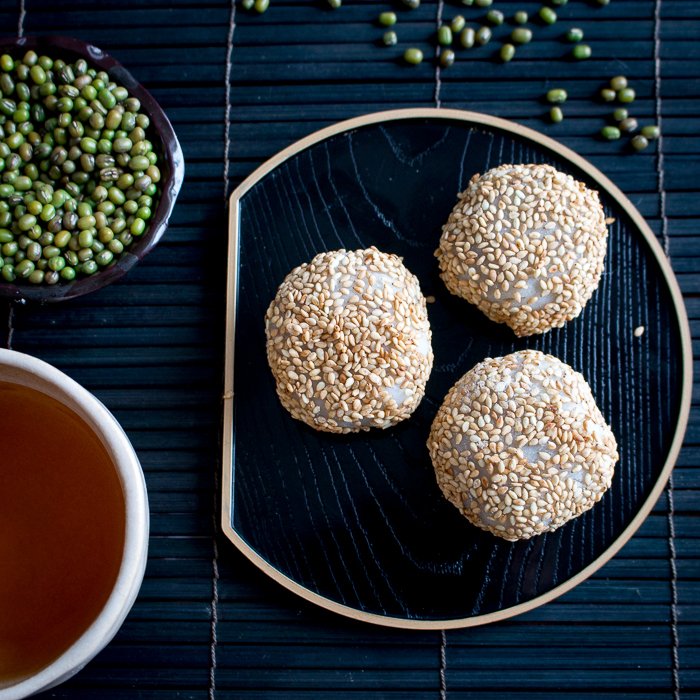 In this Mung Bean Daifuku Mochi recipe, we boil the mung beans, add sugar and pulverize with a food processor to a smooth paste. As you might be thinking, if you germinate these dried mung beans in water they sprout and become fresh bean sprouts. However, for this recipe we will be using them in their dried form. According to Traditional Chinese Medicine (TCM), mung beans clear heat and toxins from the body, balance the organs and skin, and tonify Qi. Mung beans can also improve circulation throughout the twelve channels of the body and are good for cardiac and circulatory health. If you have a cold constitution of always having cold hands and feet or diarrhea it is best not to eat too much of mung beans as they are very cooling. Please refer to our article The Five Energies of Food to learn more about this concept. During the hot spring and summer months, eating mung beans can help prevent summer heat stroke. Have you ever eaten a mung bean ice lolly or mung bean dessert soup before? 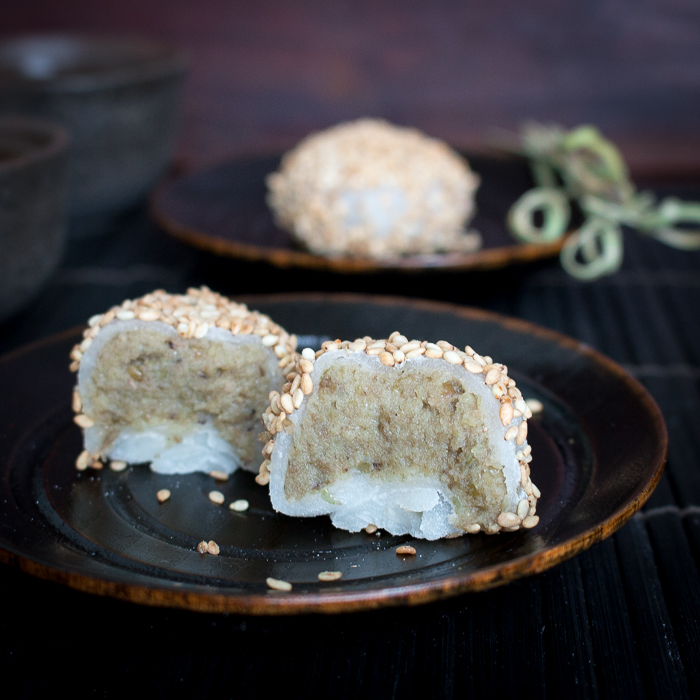 Here are some helpful hints for preparing Mung Bean Daifuku Mochi…. Mochi sticks to everything like your hands, rolling pins, board and utensils so dust everything well with potato starch so it does not stick. The microwave oven version of preparing mochi is about 100 times easier than the steaming method. Caution: The dish that you microwaved the mochi in gets hot. Use hot pads when transferring out of oven and pouring. Parchment paper is your friend when preparing mochi to prevent sticking. You can use a cup or anything round to cut the mochi into circles to prepare to stuff. We used round cookie cutters. Roll out the mochi about 1/8 inch thick. We do not like it too thick. Practice makes perfect so don’t be too hard on yourself with the first couple of ones you shape. The first couple Mung Bean Daifuku Mochi we usually eat- the bonus of being the cook. 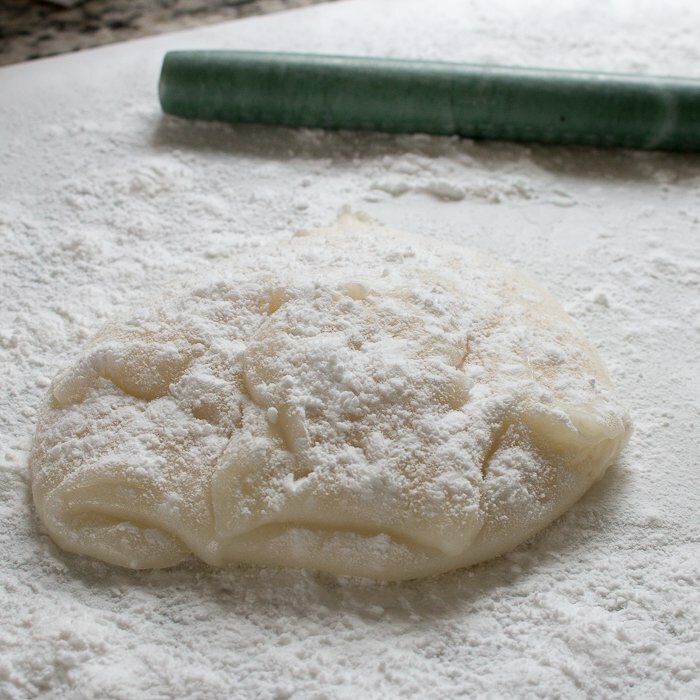 Keep your fingers well-floured in potato starch when shaping and pinching. We like to keep our mung bean daifuku mochi in the freezer because we have no self-control and don’t want to eat the whole batch in one sitting. We just take out a few for a couple of minutes when we are ready to enjoy. 1Combine glutinous rice flour and sugar in a medium bowl. 2Add water to the flour and sugar mixture and mix well. 3Cover the bowl loosely with plastic wrap. Put the bowl in the microwave and heat it on high heat for 1 minute. Take it out and stir with spatula. Cover again and cook for 1 minute. Stir again, cover, and cook for 30 seconds to finish cooking. With each session in the microwave the mochi will get firmer and lighter in color. 6Transfer the mochi with parchment paper onto a large baking sheet. Refrigerate for 15 minutes until the mochi is set. This makes it easier to cut and shape. 8Dust off the excess potato starch with a brush. Place pieces of parchment paper/plastic wrap between mochi layers and stack them out of the way to finish rolling and cutting out the rest of your mochi. This recipe makes about 10-12 wrappers. 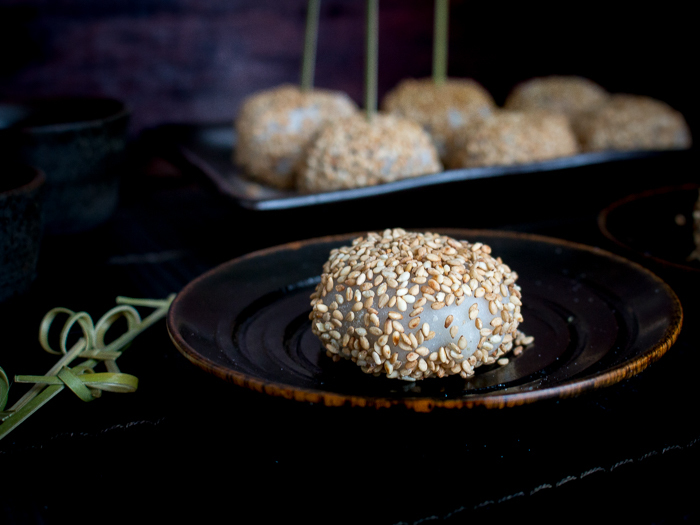 9If you wish to coat the outside of your Daifuku mochi with sesame seeds. Gently slightly dampen one side of the mocha wrapper with a small amount of water and then dip that side only into toasted sesame seeds. (You can skip this step if you want your daifuku mochi plain. 10Place one tablespoon of mung bean bean paste (or adzuki red bean paste) into the center and plain skin side section of the mochi wrapper. Pinch the 2 edges together and then the other 2 edges together four corners of the mochi to cover the mung bean paste. 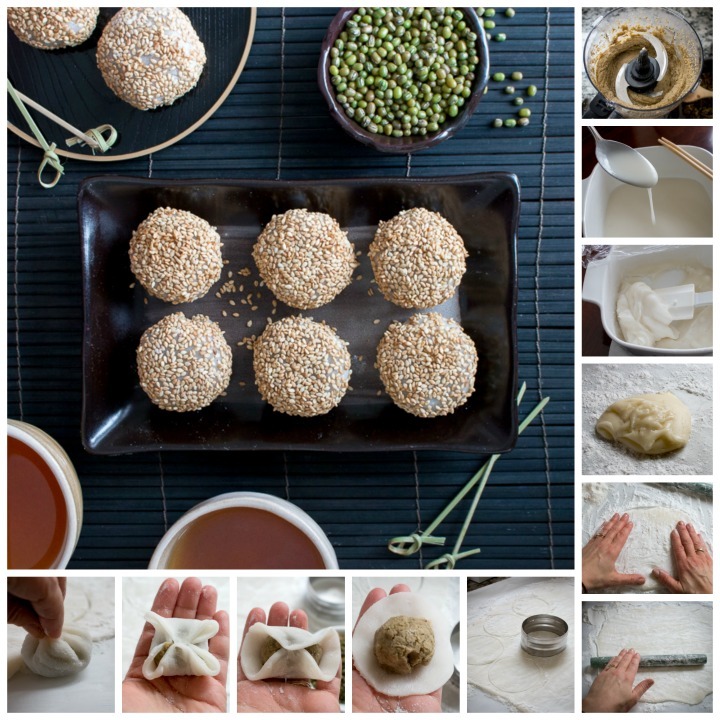 Use your fingers to pinch the remaining mochi around the mung bean paste so that it is formed into a circle and no mung bean paste is showing. 11Put some potato starch on the sealed area and set aside just so that it does not stick. Repeat process for the remaining mung bean Daifuku mochi. Enjoy! 12You can store in the refrigerator for up to 2 days or freeze up to 1 month. We love Mung Bean Daifuku Mochi a little frozen. We just take out a few out of the freezer maybe 15 minutes before ready to serve and then they are perfectly delicious.